Now that was a pretty good plate of char kway teow. It may have been because I haven't had char kway teow in more than half a year, but it's still good. I believe this is the Singapore kind - it's slippery wet and more on the sweetish side. A S$3 plate will get you a huge portion. Lai Heng also hawks otah (S$1) that you can add to your noodle order. This stall is pretty famous at Shunfu Market. According to Leslie, there is some history behind it too. Fourth generation char kway teow? I saw the daughter frying. She's not too bad. 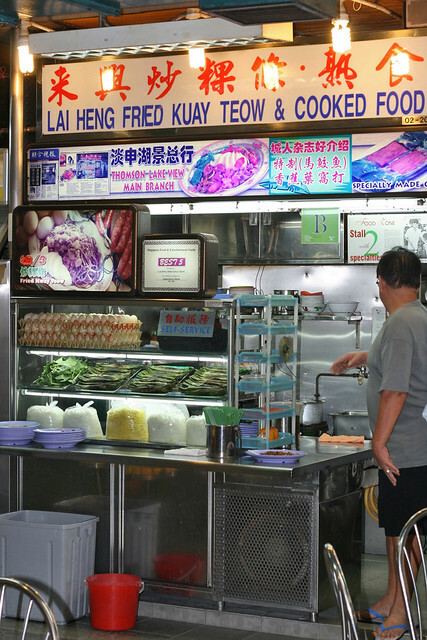 Personally, I still prefer the drier and more savoury Malaysian-style char kway teow. But this is definitely worth trying. well, i would say this is the best singapore CKT for me and my family. it has WOK HEI which is one of the most important 'ingredient'. the famous one in Bedok falls far behind and no wow factor. have returned many times and never get disappointed. agree, the penang version is still the CKT of the universe.